I love the Holiday season and especially adore being back in the Northeast where Christmas is cold and snow is forecast for today. 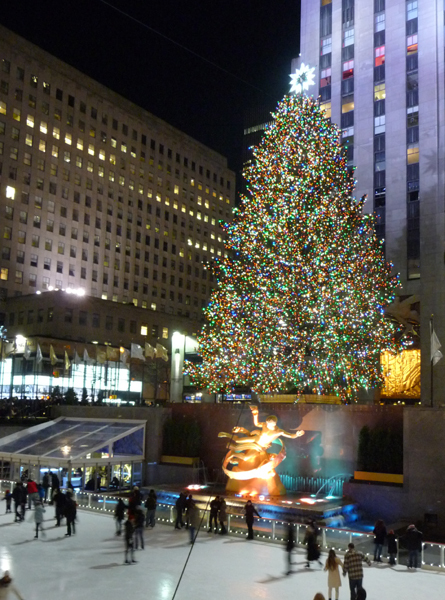 Wednesday evening my husband and I made a pilgrimage to Rockefeller Center to see "The Tree." It never disappoints. Santa's Workshop is busier than ever here at home. And I'm even trying to draw and paint a few of the projects. Here is my sketchbook page from last night, after finishing all 12 of this year's Christmas ornaments. 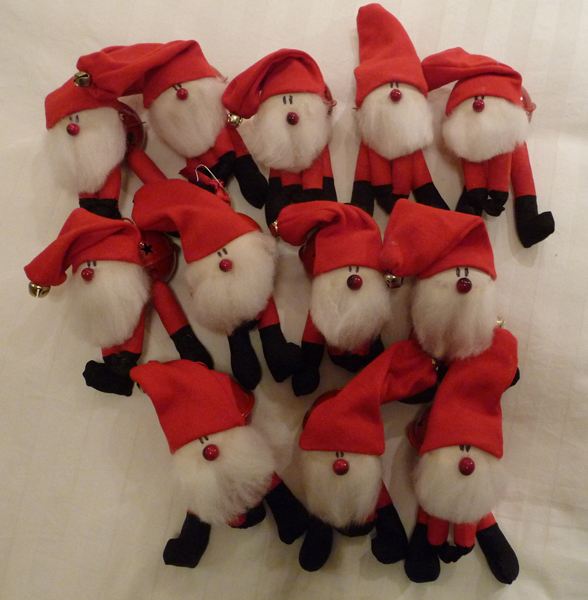 And here are the Jolly Dozen - one for each of our 8 grandchildren and one for each of our children and their spouse. This is a pattern that I bought many years ago from Twice As Nice Designs. The small size, made with a 62mm bell, is perfect for ornaments. 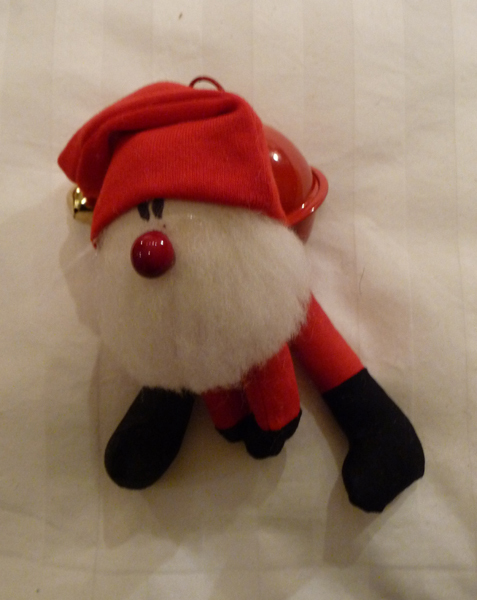 Here you can see the Christmas bell which is the body. And here his is sitting comfy. 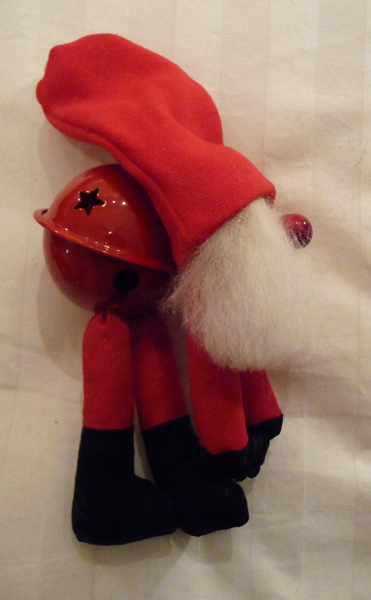 I've also made many gifts for our grandchildren - so entries from Santa's Workshop will continue next week. Our first gallery contained enormous paintings of Central Park by Janet Ruttenberg. 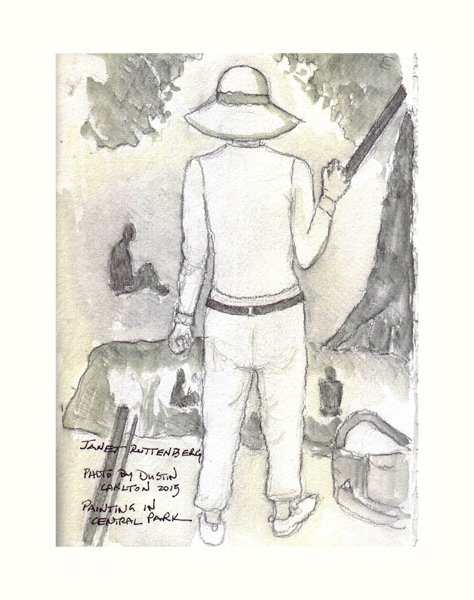 She works on huge strips of paper that are torn from a role, placed on the grass, and painted with brushes on long sticks while standing. Reading about her process was more interesting to me than the actual paintings, so I sketched from a photo of her taken during a painting session. Next we went to an exhibit sponsored by Tiffany - 100 works from New York at the end of the 19th Century, including clothes, jewelry, paintings, sculptures, and decorative objects. 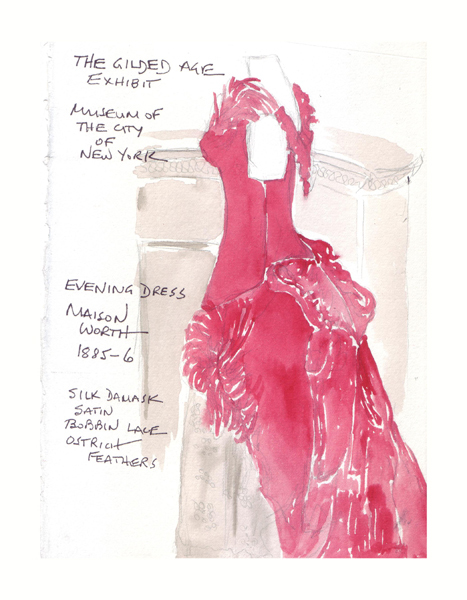 I loved one one of the evening dresses by House of Wirth in Paris and sketched and painted it. It was made of silk, satin, bobbin lace, and ostrich feathers. My final drawing was done in an exhibit about the theater and industrial designer Norman Bel Geddes. 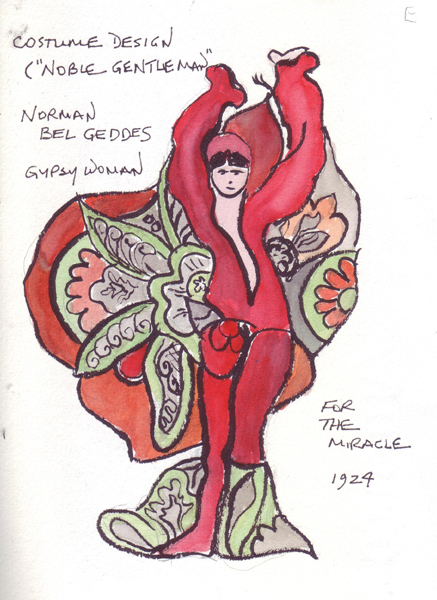 I loved this watercolor painting of one of his costume designs for a 1924 play named The Miracle. 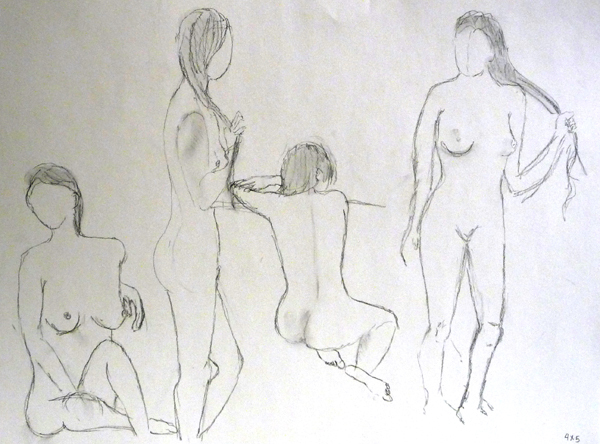 I guess I am not surprised that each of my drawings represented a figure! 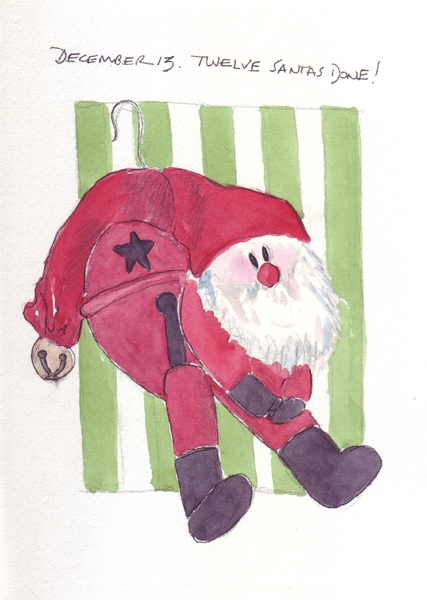 I am having trouble coordinating my schedule due to a big Thanksgiving celebration and my Santa Workshop activities as I prepare for Christmas. I looked back in my sketchbook and discovered I missed these when I visited the two exhibits with my friends in late October. Readers of this blog know that I like to copy paintings by the Masters - always hopeful that I will learn something from their styles and compositions. The Frick Collection exhibit has 15 paintings from the Mauritshuis Museum in the Netherlands, including those by Vermeer and Rembrandt. 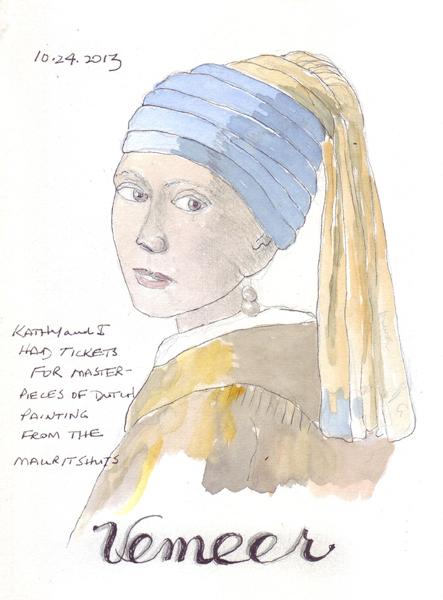 The highlight is Vermeer's Girl with the Pearl Earring and it is hung alone in a lovely gallery. The Frick displayed their 3 Vermeers and 3 Rembrandts in an adjoining gallery, so it was a real treat. There is an amazing Chagall exhibit at the Jewish Museum. 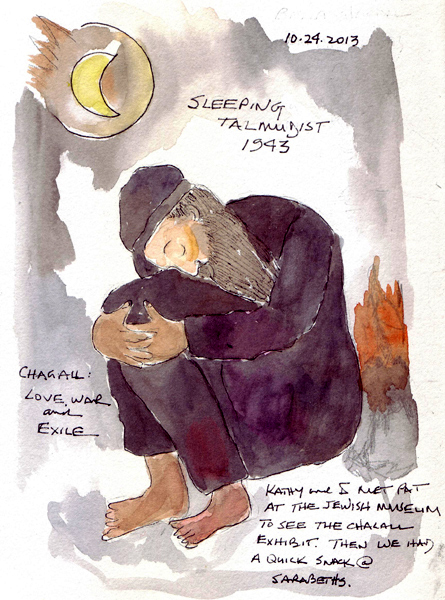 It is titled "Love, War, and Exile" and includes paintings from late in his life. I loved the shape of this figure and the composition from the moment I saw it and needed to circle back to draw it at the end. 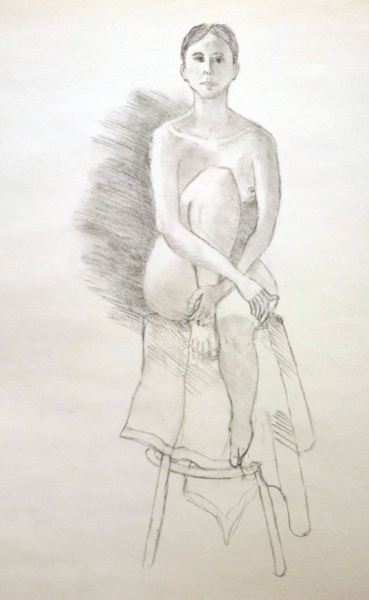 Monday is my last Figure Drawing class at FIT - and hopefully I will then have more motivation to find non-figure subjects for drawing and painting. Last night we had a choice of medium to use for our final graded drawing. I'm so thrilled that my professor recommended a General's Charcoal Pencil - #557-6B ex. soft - that I decided to use it for my 4 five minute warmup drawings and the long pose. I finally have a form of charcoal that I enjoy using. It doesn't scratch on the paper - and is buttery soft. I put all of my 5 minute drawings on the same 18 x 24" paper. The long pose was probably an hour. I draw quickly, shade, and then want to be finished! Otherwise I start making tiny, unimportant changes and get even more bored. This photo was taken with my cell phone before I handed it in. One more class this semester - and we were told that we can "do anything we want." I now love the brush and India ink, the Conte Sanguine crayon, and the charcoal pencil. I think I'll take all of them and decide when I arrive. I am posting a Halloween journal page that I did at Quilt Festival in Houston earlier this month, while I'm making lots of Santa body parts for Christmas ornaments, and planning the cooking for a huge Thanksgiving dinner for family and friends. 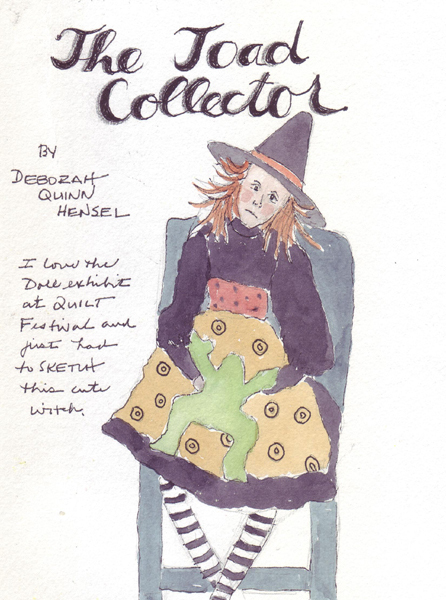 The Toad Collector is a doll by Deborah Quinn Hensel and I didn't paint her until this week. Yesterday and today I volunteered at a Book Fair to raise funds for Goddard Riverside, a settlement house in New York City. So in the midst of my Halloween-Christmas-Thanksgiving scrambled holidays, I'm only uploading one sketchbook page today.